CAN NOT BE THE SUBJECT. It must be taken into account that disruption is not the goal of a strategy, but is the side effect of a strategy aimed at developing new Values for the Users. 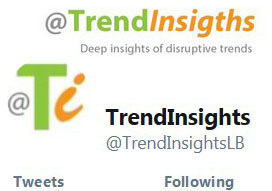 That is, disruption is a “revolutionary” action that in some way devastates current corporate strategies and organizations. How can a structure of an incunbent company develop strategies when these are disruptive for it? ● lack of “intuition”, which was the fundamental quality of the Company led by the Entrepreneur (today the companies are led by managers). Today the great players think in terms of financial capitalism, whose main focus is on how to increase profits, and not – as the entrepreneur did – on how to increase the value for the consumer. The fact is that the current managers are spoiled by decades of marketing strategies that lead consumers “automatically” to an impulse purchase (not reasoned, not tied to real needs). And so they do not have the ability to understand what are the forms of value required by Demand. 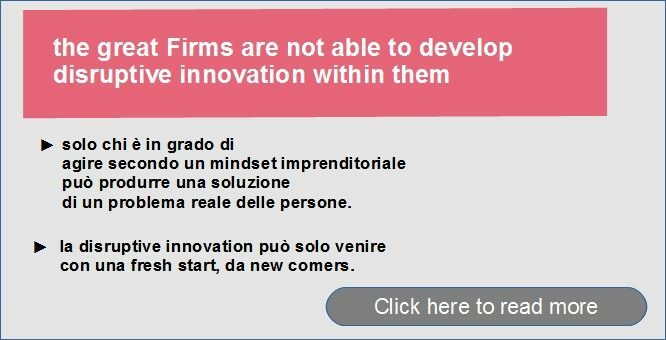 ● lack of culture of (real) innovation – the Management of major Players (including Consultants) today is not able to understand what is real (disruptive) innovation, because they are trained in schools to a unique vision of reality (that of current marketing, in fact). to a real problem of people. with a fresh start, from new comers. Obviously, it is not certain that all the great players of today’s market should fail in the future. Substantially the current players have the possibility to innovate, for example, by transferring a part of their production to another sector; or creating spin-offs. Trying to see the positive aspect of the question, from the point of view of the social system this attitude can perhaps be considered a good, since it makes the change less dramatic for the society (more gradual). But, from the point of view of the players themselves, the more time passes, the less they have the possibility to change.